On 3rd September, exthex GmbH hosted a workshop with the goal to establish an initial sketch of the DALIA business model, which provides a solid basis regarding the further plans of putting DALIA on the market. Therefore, several project partners participated in order to find a suitable solution. After the development of DALIA has finished, it is important to make the outcome available to the public. A solid business model therefore represents an important step as far as commercialization of products is concerned and is a necessary step in order to establish DALIA on the market and make it accessible for its target group. Hermann Stern (Graz University of Technology) participates with a paper and talk “Virtual Assistance in Informal Care; a (critical) Technical and Social case study of the DALIA Project” at the uDay XII: AAL test region Western Austria on May 16, 2014 in Dornbirn. The annually held uDay offers experts and researchers from science and industry an established platform to present innovative projects and research findings. Link to the Conference Program. The news paper Luxemburger Wort features an article about the DALIA consortium partner Stëftung Hëllef Doheem and also the DALIA project (the article is written in German!). 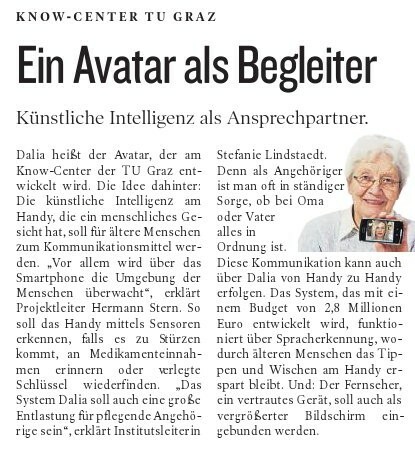 Im vergangenen Jahr wurde das europaweite Projekt Dalia („assistant for daily life activities at home“) zur Verbesserung der häuslichen Pflegedienste ins Leben gerufen. Zu Dalia gehören zehn Partner, davon drei Unternehmen aus dem technischen Bereich, drei Forschungszentren und vier Anbieter von Pflegediensten. Die „Stiftung Hëllef Doheem“ hat für Luxemburg den Bereich der Pflegedienste abgedeckt. Es geht vor allem darum, einfach nutzbare technische Mittel für die älteren Menschen, die meist weniger technikbewandert sind, zu entwickeln, um sie auf diese Weise im Alltag zu unterstützen, damit sie so lange wie möglich zu Hause leben können. Diese Instrumente dienen als Hilfe beim Informationszugang, bei der Kommunikation, bei der Steuerung der Technik usw. damit die Produkte voraussichtlich 2016 vermarktet werden können. On Thursday the 24th and Friday the 25th October, the DALIA partners have gathered in the business center of Stëftung Hëllef Doheem in Luxembourg City for a half year coordination meeting. DALIA (Assistant for Daily Life Activities at Home) is an AAL Call 5 EU-funded project in the area of Ambient Assisted Living (AAL). AAL is concerned with improving the quality of life of elderly, sick and chronically ill people on the basis of technical solutions. DALIA aims at hiding the complexity of a fully integrated AAL solution behind a human-liking Avatar with which the user can interact (for instance with television and phone). This voice controlled virtual personal assistant will assist both elderly users (for instance by assuring that they get “enough” social interaction and physical exercise) as well as their informal and professional carers. 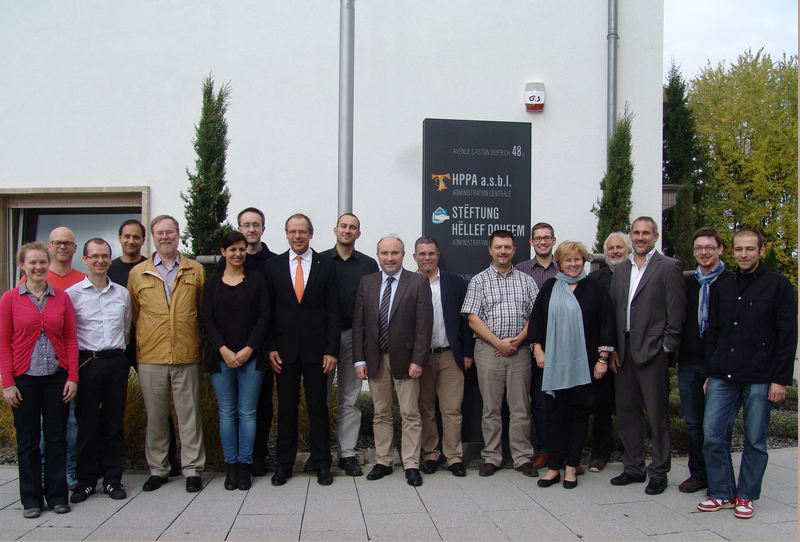 Ten European partners from Austria, Switzerland, Luxembourg, Belgium, and the Netherlands are forming the DALIA consortium. Three of the partners are engaged in commercial activities ( exthex, TP Vision, Virtask), three organizations are working in research (Research Applied Sciences Upper Austria, Graz University of Technology, and iHomeLab) and four service providers (Stëftung Hëllef Doheem, terzStiftung, t Dijkhuis and Volkshilfe Styria) are active in the areas of counseling and (home) care. During the two working days in Luxembourg, the partners have finished the initial requirements elicitation process which involved more than 200 elderly people respective their informal carers. In addition, a prioritization of the available functionality in the future, technical requirements, the system architecture and integration, as well as the operation of the various systems have been determined. The first prototype of the DALIA avatar will be completed in late 2014; at the end of the project in March 2016, a marketable end product will be available. 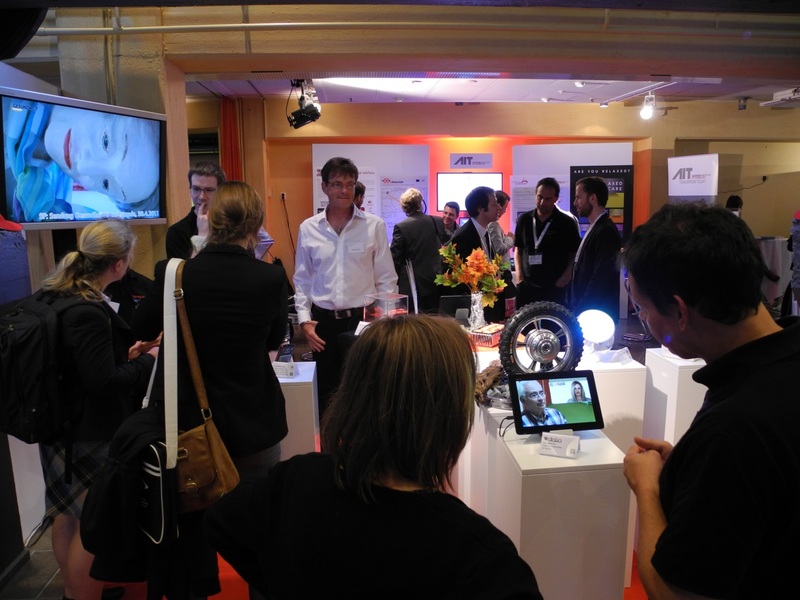 The DALIA project will be presented in the Smart Health Track of the i-KNOW 2013 on September 5th, 2013.
is to provide the right medical knowledge at the right time! of knowledge management applications in the health sector. Ambient Assisted Living primarily deals with improving the quality of life of elderly, sick or chronically ill people. The aim of DALIA is to support elderly people staying in their own homes by helping them to master their daily activities. In DALIA it’s the users with their needs and requirements who stay in the foreground, and not the technology, concepts, products and services behind. In addition to the requirement analysis together with the four use case partners we separately collect general requirements for an Ambient Assisted Living solution. Thus we would kindly ask you to fill out the questionnaire linked below (and also distribute it to your family, friends, and in particular persons who currently are caring for their relatives, or plan to do so in the future).